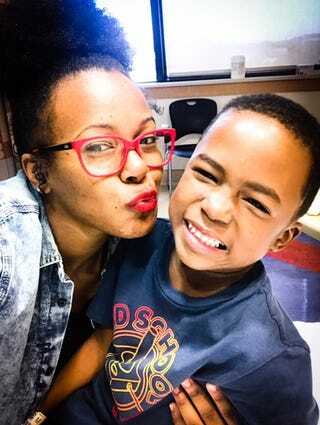 In July 2016, a resilient, joyful 5-year-old named Bryce took part in a first-of-its-kind clinical trial at Children’s National Health System in Washington, D.C. As an infant, Bryce had been diagnosed with a particularly severe form of sickle cell disease and had already suffered at least four strokes related to the blood disorder. A little more than a year later, his doctors say Bryce is cured of sickle cell and thriving. He has started school for the first time and is learning how to navigate the world without his mother, who had been at his side since he had his first sickle cell crisis at 6 months old. Heretofore, the only way to be cured of sickle cell was to get a bone marrow transplant, which required a “match” with a compatible donor, usually a close relative. What made Bryce’s trial unique is that in his case, his donor was only a partial match. “Traditionally, the problem is that there’s a less than 25 percent chance that a patient will have a matched donor,” says Dr. Allistair Abraham, a bone marrow transplant specialist and lead investigator in the clinical trial in which Bryce took part. In Bryce’s case, however, his body was able to rid itself of the sickle cells with a relative who was only a partial match, his grandfather. Bryce was a good candidate for the trial because he had a particularly severe form of sickle cell, hemoglobin SS. His mother also has the disease and said that she was understandably crushed when she learned her baby would have the same fate. But what McDowell didn’t know at the time was how bad it was going to get. But after that first hospitalization, the 27-year-old mother says that she and Bryce became mainstays at Children’s National and its emergency room, mostly because Bryce repeatedly came down with skin infections, a common side effect of sickle cell because the spleen does not function properly with sickle cell disease. “He was always there to get antibiotic shots,” she recalls. But the worst day—one she says she will remember for the rest of her life—was Dec. 8, 2013, when Bryce had his first stroke. “Bryce was taking a nap. And he woke up with a crick in his arm. And [my fiance and I] were like, ‘Should we go to the doctor, should we leave it alone? Was it a muscle spasm?’” says McDowell. “Because he was a sickle cell patient and prone to a lot of things, we decided to call the ambulance. And we rushed to Children’s. When they called his doctor, she said he could be having a seizure, or he could be having a stroke. My heart immediately stopped,” says McDowell. Bryce was only 2 years old. Strokes would happen two more times, each time with different symptoms. McDowell was unable to work and Bryce was unable to go to school because of his condition’s volatile unpredictability. Both of their lives revolved around the hospital, where Bryce received biweekly blood transfusions, during which he would pass out. He had been on the bone marrow donor list since he was 3, but there was no match. “When he started having the strokes and they couldn’t stop the strokes with transfusions and exchange transfusions, Bryce had what is called EDAS [encephaloduroarteriosynangiosis] surgery,” says McDowell, who was understandably at her wit’s end. The surgery was supposed to correct the flow of his blood vessels and repair them on the left side, but Bryce ended up having a stroke on his right side. McDowell says that Bryce’s lead doctor, Dr. Jennifer Webb, introduced her to Abraham and the first phase of the trial known as HAPSICKLE, which is funded in part by the hospital’s philanthropic fund and the National Institute of Child Health and Human Development. Bryce’s grandfather wound up being a partial-donor match, and by all accounts, the trial was a success. Bryce has had no complications more than a year later and is now down from 14 medications to about six. Abraham says that Bryce was a particularly good candidate for the trial because he did not have a traditional family donor match, there was no other major organ damage (sickle cell tends to attack and damage organs the longer the disease progresses) and he had already suffered major complications to his brain. The procedure itself was relatively short, and especially easy on the donors, for whom providing bone marrow is similar to the process of giving blood. During the first year after the transplant, patients have to be careful not to be exposed to people who are sick because their immune system needs time to recover. But there are patients that can go back to school, back to work. They also do not have to be on medication for the rest of their lives related to the transplant (as happens with a kidney transplant, for instance). And though the doctor cautions that a cure for all may be years away (the second phase of the trial is not expected to start until about 2019), the implications for those who have sickle cell disease are enormous. As for Bryce, he and his mother are taking their new lives step by step. She is looking for a job, and Bryce is easing into a “normal” childhood. “I just want him to be a testimony to somebody else and just live his fullest life. Because I feel like his childhood was taken from him because of so much of what he had to go through,” McDowell says. Be more educated and try to educate people about the disease and understand what the treatments are. A hematologist is a good place to start. To learn more about clinical trials around sickle cell disease, go to ClinicalTrials.gov, Children’s National Health System, the Sickle Cell Disease Coalition or the Sickle Transplant Alliance for Research.